For Windows Developers who need to display movie thumbnail and image thumbnail in C++ , C#, VB.NET , VB, Delphi, Vfp, Ms Access. 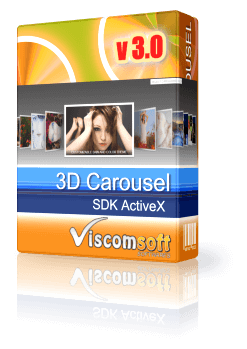 Support get poster frame from MP4, MOV WMV,MPEG1,AVI,ASF movie file format. Support raw image format, including CR2, NEF, CRW, MRW, RAF, ERF, 3FR, DCR, RAW,DNG, PEF, X3F, ARW, SR2, MEF, ORF image format. Support skip black frame for movie file. 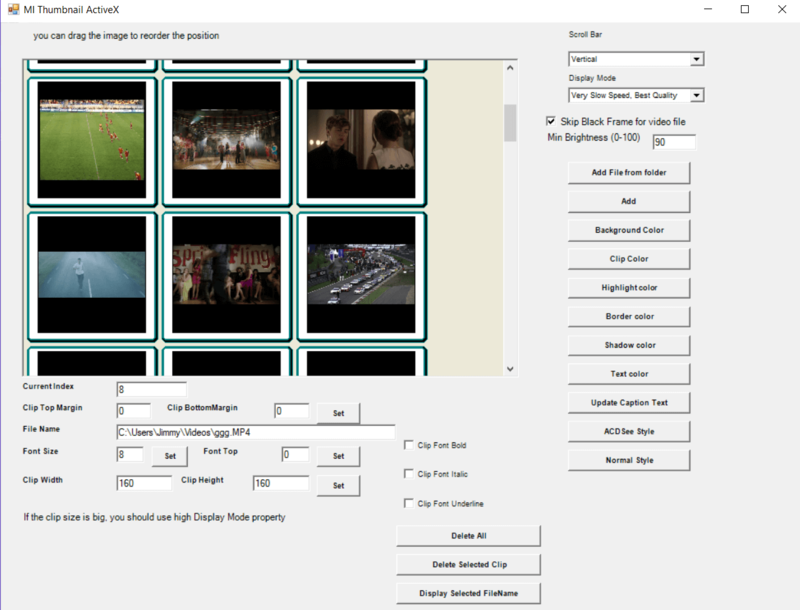 Create ACDSee style image/movie Browser, only one minute. Support loading the image clips from folder. Support rotate the image clip at specifies index. Allow user define Vertical or Horizontal scroll bar in thumbnail view. Has ability to preserve Aspect Ratio. Has ability to create ACDSee style image Browser in only one minute. Allow user to define image clip (Background / Clip / Highlight / Shadow / Text color/Font Size). Provide Royalty free distribution of the OCX file. Provide scroll event control which give developer fee control in scroll line up/line down, scroll page up/page down, scroll top/down events. Include VB.Net 2015, VB.Net 2010, Delphi , Visual Basic ,Visual Foxpro, Sample Code. added support get poster frame from MOV, MP4 video files. added support skip black frame for video files and skip the black poster frame with specific minimum Brightness. updated VB6, VB.NET 2010, VFP samples. added vb.net 2010 samples and fixed cannot run on 64 bit OS issue. redesign the thumbnail engine, now all features same as image thumbnail cp activex. added support loading raw image file format. added support loading image clip from folder. added allow rotate the image clip at specifies index. added AddClipsFromFolder, BrowseFolder, DeleteAllClips, GetTotalClipSelected, Rotate methods. added support loading PDF file. added support JPEG 2000, PCX, WMF, WBMP, TGA, PGX, RAS, PNM file formats. added HScroll method to Programmatically Horizontal Scrolling. added user define Vertical and Horizontal scrollbar in thumbnail view. added user define display mode and image quality. fixed small image stretching issue. added AddCustomType, RemoveCustomType methods ,support load customizable file formats. added EnableMultiSelect property, enable or disable multiselect thumbnails.